Government officials who pushed the Iraq War in 2002-2003 are fond of claiming that they were simply deceived by "bad intelligence," but the process was not that simple. In reality, there was a mutually reinforcing scheme to flood the U.S. intelligence community with false data and then to pressure the analysts not to show professional skepticism. In other words, in the capital of the most powerful nation on earth, a system had evolved that was immune to the normal rules of evidence and respect for reality. Propaganda had become the name of the game, a dangerous process that remains in force to this day. Regarding the Iraq War case, one of the principal culprits fueling this disinformation machine was Iraqi exile Ahmed Chalabi, who died on Nov. 3 at the age of 71 from a heart attack. Chalabi, head of the U.S./neocon-backed Iraqi National Congress (INC), not only pumped intentionally false data into this process but later congratulated his organization as "heroes in error" for rationalizing the invasion of Iraq. The INC's principal tactic was to deluge the U.S. intelligence community -- and the mainstream media -- with "defectors" who provided lurid accounts of the Iraqi government hiding WMD caches and concealing its ties to Al Qaeda terrorists. Because of the welcoming climate for these lies -- which were trumpeted by neoconservatives and other influential Washington operatives -- there was little or no pushback. Only after the U.S. invasion and the failure to discover the alleged WMD stockpiles did the U.S. intelligence community reconstruct how the INC's deceptions had worked. As the CIA and the Senate Intelligence Committee belatedly discovered, some "defectors" had been coached by the INC, which was fabricating a casus belli against Iraq. In 2006, the Senate Intelligence Committee released a little-noticed study on the role of phony "defectors." The report revealed not only specific cases of coached Iraqi "defectors" lying to intelligence analysts but a stunning failure of the U.S. political/media system to challenge the lies. The intimidated U.S. intelligence process often worked like a reverse filter, letting the dross of disinformation pass through. The Iraqi "defectors" and their stories also played into a sophisticated propaganda campaign by neocon pundits and pro-war officials who acted as intellectual shock troops to bully the few U.S. voices of skepticism. 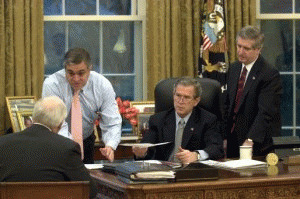 With President George W. Bush eager for war with Iraq -- and Democrats in Congress fearful of being labeled "soft on terror" -- the enforced "group think" led the United States to invade Iraq on March 19, 2003. According to the Senate report, the official U.S. relationship with these Iraqi exiles dated back to 1991 after President George H.W. Bush had routed Saddam Hussein's army from Kuwait and wanted to help Hussein's domestic opponents. In May 1991, the CIA approached Ahmed Chalabi, a secular Shiite who had not lived in Iraq since 1956. Chalabi was far from a perfect opposition candidate, however. Beyond his long isolation from his homeland, Chalabi was a fugitive from bank fraud charges in Jordan. Still, in June 1992, the Iraqi exiles held an organizational meeting in Vienna, Austria, out of which came the Iraqi National Congress. Chalabi emerged as the group's chairman and most visible spokesman. But Chalabi soon began rubbing CIA officers the wrong way. They complained about the quality of his information, the excessive size of his security detail, his lobbying of Congress, and his resistance to working as a team player. For his part, the smooth-talking Chalabi bristled at the idea that he was a U.S. intelligence asset, preferring to see himself as an independent political leader. Nevertheless, he and his organization were not averse to accepting American money. With U.S. financial backing, the INC waged a propaganda campaign against Hussein and arranged for "a steady stream of low-ranking walk-ins" to provide intelligence about the Iraqi military, the Senate Intelligence Committee report said. The INC's mix of duties -- propaganda and intelligence -- would create concerns within the CIA as would the issue of Chalabi's "coziness" with the Shiite government of Iran. The CIA concluded that Chalabi was double-dealing both sides when he falsely informed Iran that the United States wanted Iran's help in conducting anti-Hussein operations. "Chalabi passed a fabricated message from the White House to" an Iranian intelligence officer in northern Iraq, the CIA reported. According to one CIA representative, Chalabi used National Security Council stationery for the fabricated letter, a charge that Chalabi denied. In December 1996, Clinton administration officials decided to terminate the CIA's relationship with the INC and Chalabi. "There was a breakdown in trust and we never wanted to have anything to do with him anymore," CIA Director George Tenet told the Senate Intelligence Committee.